Now you can achieve excellent resin & catalyst metering while dramatically lowering material & labor costs normally associated with bucket & brush applications. With the M.V.P. Quick Shot, resin & catalyst are dispensed quickly and more evenly with little clean-up and low emissions! Accurate ratios without the hassle. The no drip, easy-to-use ball valve opens resin and catalyst flow precisely and evenly. Because two materials are pumped separately into the pail, there are no accumulators to charge and no gun to flush. 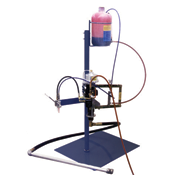 Very simple to operate, resin and catalyst can be mixed by hand or with an optional air-driven pail mixer to disperse the catalyst throughout the resin. The Quick Shot features an 11:1 power ratio positive displacement fluid pump, capable of delivering up to 8 lbs. per minute. Slaved to the resin pump, the catalyst pump can meter measured amounts of MEKP into the resin varying from 1 % to 2.5% of the volume of the resin. If your production demands accuracy, speed and efficiency, the Quick Shot is for you. Call today to learn how the Quick Shot can deliver for you! approximately 4 – 8 lbs./min.